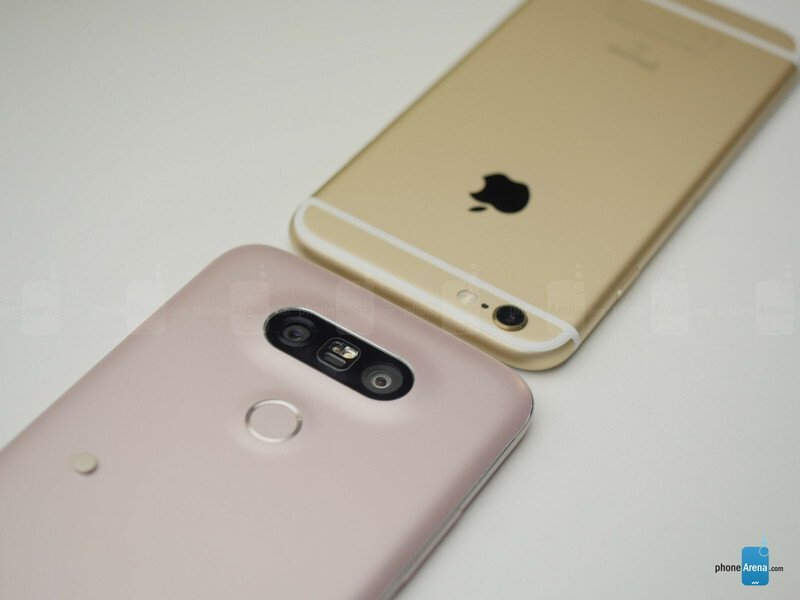 The LG G4 is a much larger, heavier, and with a totally different design language phone than the iPhone 6s, so we bet that swapping one for the other hasn't been the question on many an iPhone 6s owner's mind when Apple launched their finest last year. This year, however, LG is joining the ranks of phone makers utilizing "premium" design materials, and is so proud of its hot G5 creation, that it unveiled it ahead of the Galaxy S7 on the same very day. 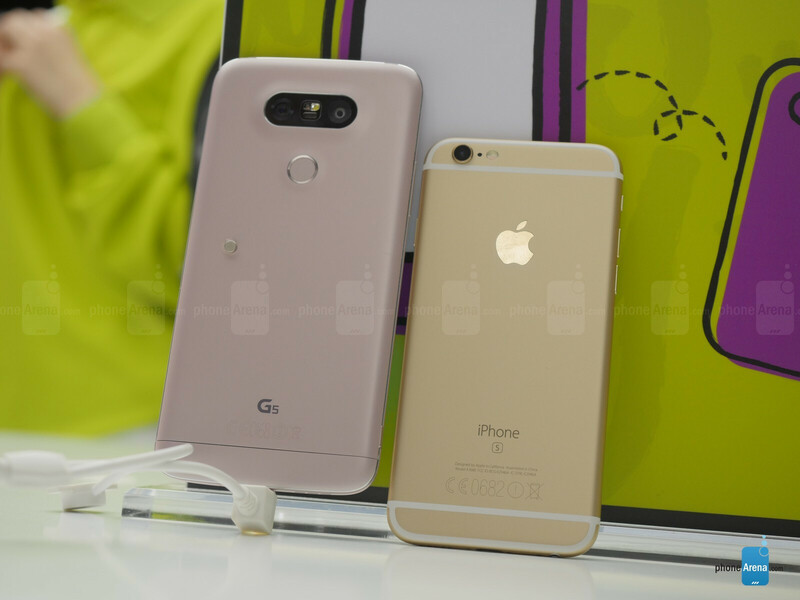 Let's see if the iPhone 6s owners have more reasons to consider the G5 before their current handset now that the G5 is already announced and handled by us next to the iPhone at the MWC 2016 expo. The G5 is a radical redesign for LG's G-line, as it features a slim metal body, not a plastic one, and a smaller 5.3" screen compared to the 5.5-incher of its predecessors. The metal body and rounded corners is where the similarities with the iPhone end, though, as it is much larger than the 4.7" 6s, though it doesn't feel all that heavier. LG G5 can't flaunt a stellar screen-to-body ratio, just like the iPhone, as it has a removable modular mechanism at the bottom, which lets you add various functional attachments to it, or, as LG like to call them - Friends. The 5.3" Quad HD panel of the G5 has a much higher pixel density than the iPhone, but for all practical purposes the 4.7" panel carries its smaller resolution pretty well. The viewing angles of the IPS displays on both phones are excellent, so no complaints in that regard. While LG boasts its panel can reach 850 nits brightness, and the iPhone maxes out at 550 nits, screen reflectance ratio is also important outside, and we only had a chance to preview the handsets indoors, so we can't vouch if the G5's screen will feel brighter outside indeed. LG planted a new Android 6.0 Marshmallow overlay on the G5 lacking an app drawer, which makes it that much similar to what we have on iOS. Apple’s latest iOS 9 experience might not bring forth any dramatic changes, 3D Touch features aside, but it still pay tribute to the fundamental characteristics of being simple, responsive, and straightforward. While it’s easier on the eyes, it gives way a bit in functionality, especially on the multi-tasking side that we get in LG’s customized experience. 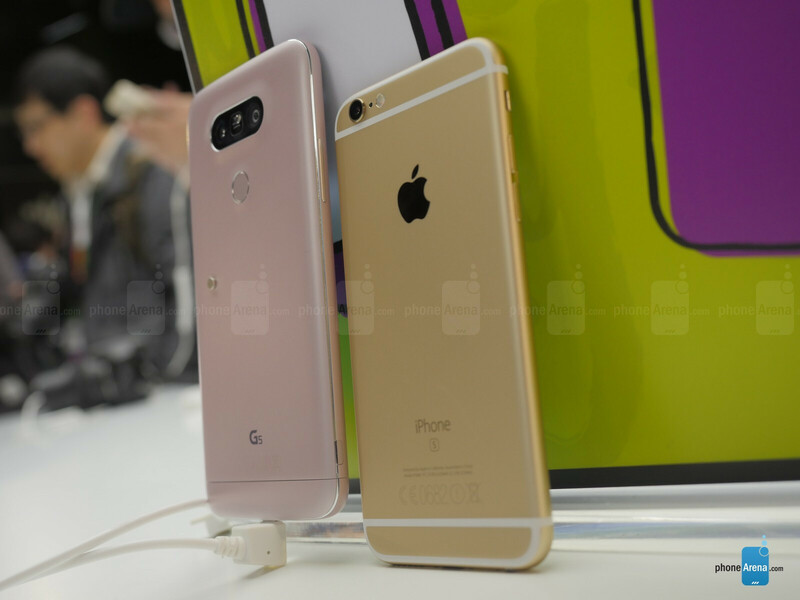 LG G5 is powered by the newest Qualcomm chipset - Snapdragon 820 - but don't get overly excited, as the Apple A9 on the iPhone 6s can match and surpass its single-core performance in synthetic benchmarks, and in actual operation of the interface feels a bit smoother, too. LG, however, placed the whopping 4GB of DDR4 RAM, giving multitasking on the G5 a boost for the heavens. The iPhone 6s can be picked up in either 16GB, 64GB, or 128GB capacities, but there’s no room for expansion on neither of those versions. Despite going metal, LG has still provided a microSD slot, in addition to the basic 32 GB storage amount on the G5. Perhaps the most intriguing feature of the G5, besides its modular design, is the 16 MP/8 MP dual camera combo on the rear, allowing the sensors to reach a much wider field of view than when shooting with a single lens. 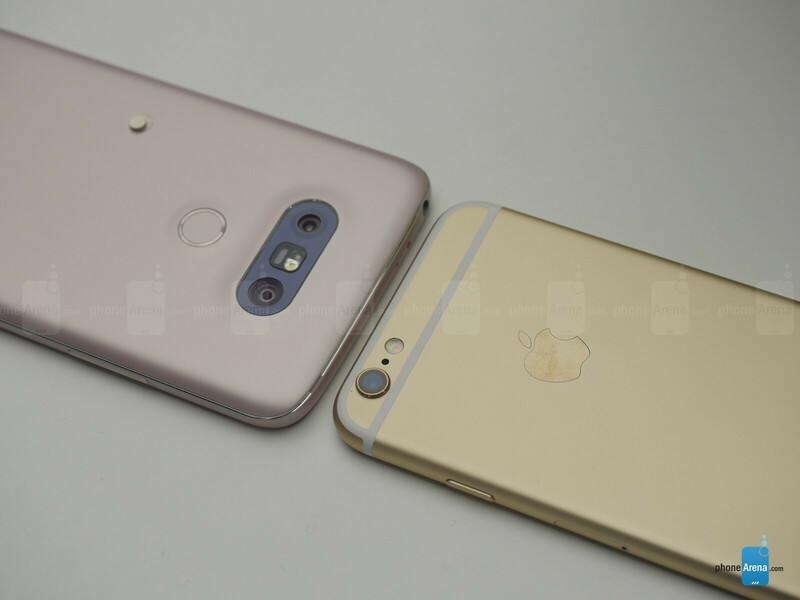 In addition, the phone flaunts laser AF and optical image stabilisation, which the 12 MP shooter on the iPhone 6s lacks. Both phones feel extremely snappy to focus and take a shot, but LG offers more functions in the camera interface. As for the camera qualities, judge for yourself, as we snapped a few comparison shots with those puppies for your viewing pleasure. Don't give them too much thought, though, as the LG G5 is likely still not with a finalized software, and also be patient as these are the full size samples, so they may occupy some loading time. After going through the motions with the G5 and iPhone 6s, we can vouch for the more premium feel of LG's newest darling, which now brings it much closer to Apple's current choice for the chassis of the iPhone. 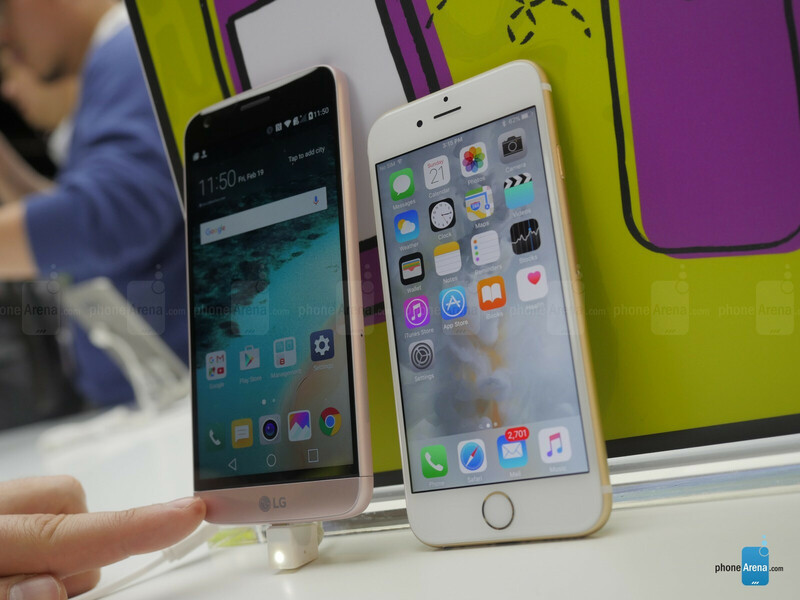 The G5 is thin, powerful, and has a flexible modular design, which might be more useful to some than the unibody concept of the 6s, though when it comes to size and manageability, the iPhone 6s will suit one-handed operation much more than the largish G5 body. What is that big ugly thing around the G5 screen? It looks so hideous, especially the one at the bottom. 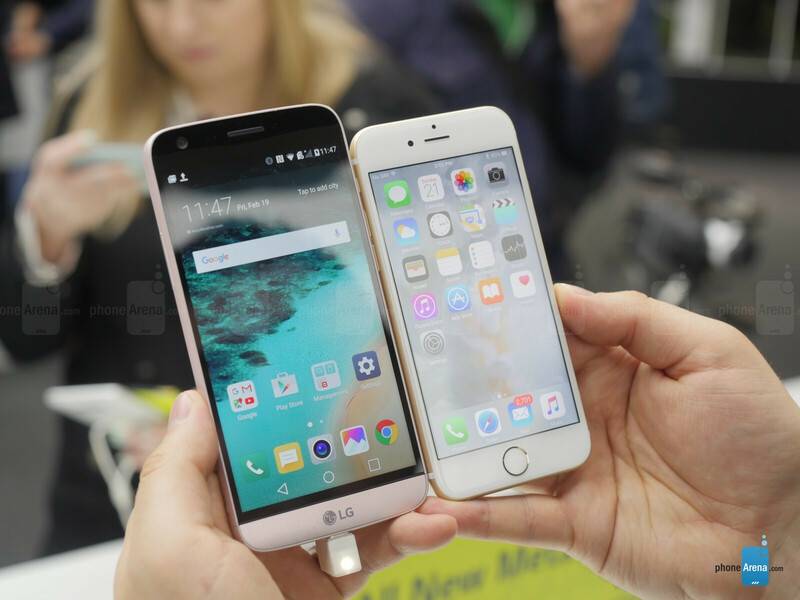 The G5 is superior to the low resolution iPhone 6s. There was no mention of the G5 magic slot. Considering you can remove the bottom of the G5 and add a Bang and Olufsen 32 bit dac with another jack, or add a camera accessory with an extra battery. 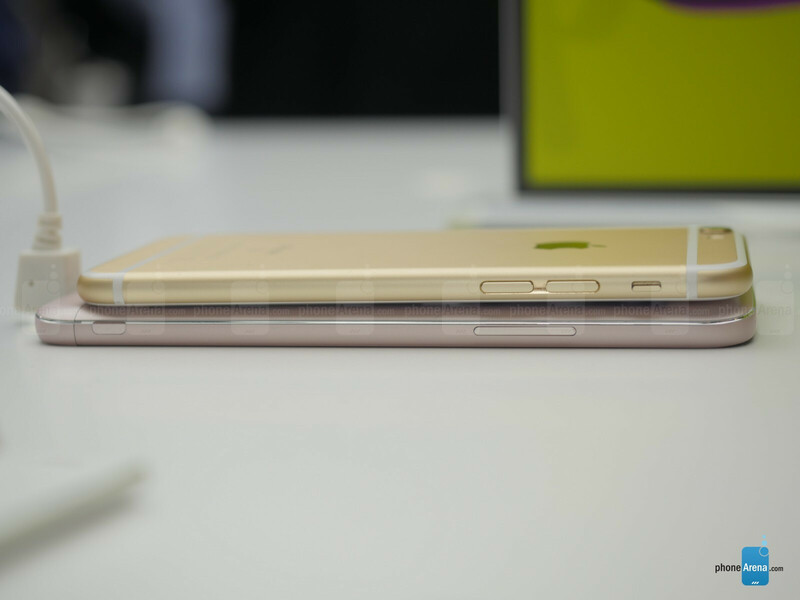 Have you ever held an iPhone 6s? 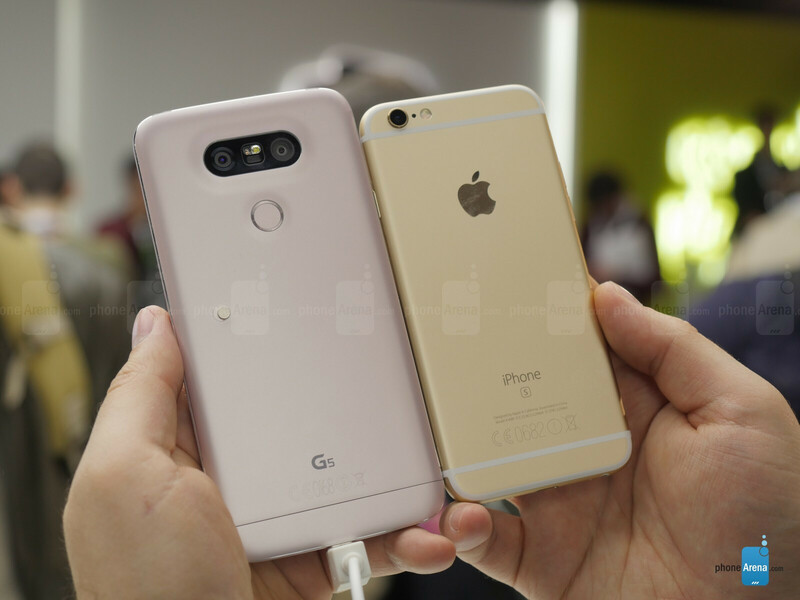 the G5 has a much better screen resolution.. however holding both an IPhone and a G4 (since i haven't held a G5 yet).. there is only one difference when it comes to the screen.. the G5 was shaper and not by much, when it comes to things like detail both the iPhone and G4 showed the same. And from my memory, the iPhone still dominates G5 in some benchmarks and completely destroys the G4. Performance wise the iPhone 6s and the soon to be iPhone 7 will be superior. I've noticed that they try to make the top and bottom AND side bezels look smaller by adding that black "dead space" around the screen, HTC did that to give you a feel of wedge to edge screen. That's a bit deceiving. iPhones also have bezels that match the color of the front of the phone and earpiece, I really think most phones do. I don't know why, but because everyone does it I'd guess there are engineering difficulties preventing making the front look the same as the back. I Kinda prefer the V10 to the G5.. the look atleast. I love how when a new budget phone with an HD screen gets released they say it's low res, but the iPhone's 730p "carries the lower resolution pretty well."